"Of no less importance and substance than the Sumerian Epic of Gilgamesh, the O'Brien scholarship applied to the linked Kharsag Epics now demands the recognition and respect it has long deserved from the archaeological establishment" - "The fact that O'Brien, using his milti-disciplinary skills, brings so much additional evidence in support of his basic thesis for the revision of the Genesis text into a down to earth farming story, must encourage other scholars to climb out of religious straightjackets and seek to confirm the truth." "This book is a neglected classic which has a revolutionary thesis of fundamental importance to our understanding of the ancient past" - "Based on the O'Brien deep knowledge of ancient Middle Eastern sites and languages, it completely re-interprets the origins of civilisation and pushes the dates back by thousands of years". Author and Coordinator of the Wessex Research Group Network. "As a result of Christian O'Brien's translation of this ancient story from these clay tablets from the Nippur library, the whole Genesis story lies open for re-examination" - "In writing about books, Francis Bacon declared that there were some few to be chewed and digested - The Genius of the Few is such a book". "The thesis of the book is so startling that it should have caused a major controversy when it was first published. However it was too controversial for the scholars and too sober and erudite for the popular audience, yet since that time it has attracted a growing number of readers. With its careful, scholarly and un-sensational approach, the evidence for the real existence of the Anannage as the founders of civilization strikes me as fascinating and convincing". Best selling author and broadcaster. "Stunning ! - This book has everything to commend it as a valuable academic gem - it certainly rates as a Five Star accomplishment". "I have placed it in the Department Library where I am sure it will be most useful as it is likely to provoke response from archaeologists and scientists of all types. You are to be congratulated on producing such a work". Western Asiatic Department of the British Museum.
" 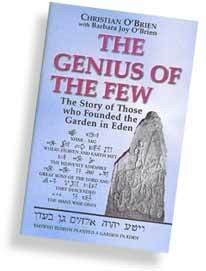 All modern concepts of the Garden of Eden stem from a few verses in the biblical Book of Genesis, none of which is entirely free from ambiguity", begins the O'Brien analysis after a short preface and introduction. Many intelligent and well-read individuals would agree with this statement however very few can argue coherently on or near the point. The Genius of the Few stands ready to arm the most reluctant of debaters with evidence and clarity sufficient to maintain a sturdy, well-informed posture when debating the early biblical texts. Geewizster Blogspot - Genius of The Few Review.